BEIJING (Reuters) - China's exports surged more than expected in July despite U.S. duties and its closely watched surplus with the United States remained near record highs, as the world's two major economic powers ramp up a bitter dispute that some fear could derail global growth. In a statement on its official website late on Wednesday, China's commerce ministry criticized the U.S. move as being "unreasonable", saying it had no choice but to adopt the same measure on an equal amount of American goods ranging from fuel and steel products to autos and medical equipment. 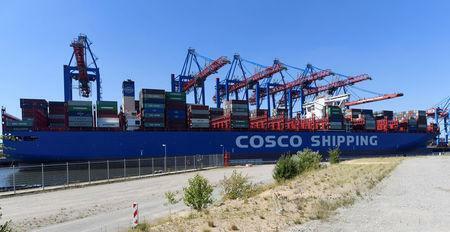 Wednesday's Chinese data provide the first readings of the overall trade picture for the world's second-largest economy since U.S duties on $34 billion of Chinese imports came into effect on July 6. All the same, China's exports for July rose a bigger than expected 12.2 percent year-on-year, showing little tariff impact for now and beating June's 11.2 percent rise and analysts expectations in a Reuters poll for 10 percent growth. Of more direct consequence in the Sino-U.S. trade war, China's surplus with the United States shrank only marginally to $28.09 billion last month from a record $28.97 billion in June. Washington has long criticized China's trade surplus with the United States and has demanded Beijing cut it. "Currency devaluation, which may have helped exports to some extent, has been largely market-driven in our view and is not a preferred policy tool by Chinese policy makers as part of the retaliation measures," Wang said. China's trade with the U.S. also continued to rise in July despite the tariffs, with exports up 11.2 percent year-on-year, and imports increasing 11.1 percent. Analysts still expect a less favorable overall trade balance for China in coming months given it's early days in the tariff brawl. Several large American companies have said they would adjust their supply chains to source outside of China if tariffs on Chinese goods impacted them, while China's Haier Group <1169.HK> said rising steel prices amid hefty U.S. import tariffs was driving up costs for its business in America.